It’s a sunny, warm afternoon and kids are darting back and forth all over the lacrosse fields. Helmets that look too big for their heads rattle and shake as they sprint towards the goal. 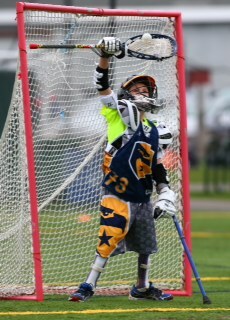 At the center of this chaotic, exciting game stands Kane Goodman, the goalie for Andover’s 5th grade lacrosse B team. But Goodman is no ordinary goaltender. He stands in the goal with a single crutch and a modified goalie stick. And Kane certainly doesn’t let his disability hold him back on any of the sports fields. In the off-season he also plays baseball, sled hockey, and mono skis. Playing a total of four sports, Kane is actually more active than many other kids his age. Kane’s story can serve as an inspiration for us all. He truly demonstrates that nothing can hold you back unless you let it, and that perseverance and heart will always prevail.